AcceleDent® Aura is a light, comfortable, and hands-free appliance that is used 20 minutes per day as a complement to orthodontics. The exclusive SoftPulse Technology’s™ precisely-calibrated micropulses gently accelerate the movement of your teeth as they’re guided by your orthodontics. 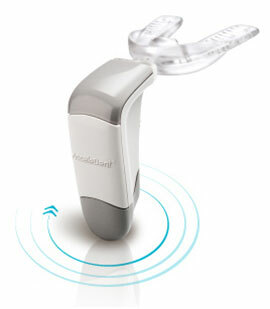 With patented SoftPulse Technology, AcceleDent® Aura’s vibration is a safe approach for accelerating tooth movement. In fact, the force applied to teeth during ordinary chewing is at least 200x greater than the force applied with AcceleDent® Aura. Dr Fennig, Dr Doshi and all of the assistants are the best!!! My son’s top front tooth was impacted. We were starting to think we’d never see it, until we found Greater Madison Orthodontics! !